I’m so excited to share these birthday cards, free for you to print and share with those you love. I created them for my Church Young Women’s Group (more YW stuff here) to wish them them birthday wishes. 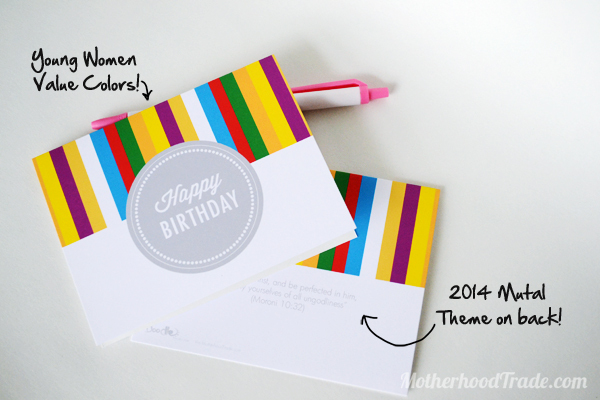 They sport the Young Women value colors and the 2014 Mutual theme on back, woot! If you want to use them for more general purposes, here is the same colors without the theme on the back. ENJOY. To print with rich colors, I like to use matte photo paper that is compatible with my printer. For other printable note cards, check out my shop. .